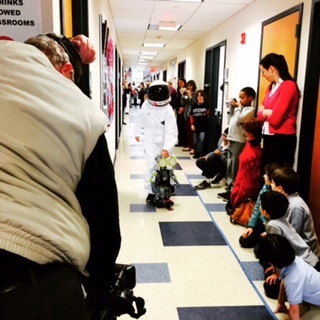 Our Director of Interdisciplinary Projects takes our gifted students on a projects-based learning adventure with an out-of-this-world mission to Mars! Before I was a co-teacher in Grayson’s K-3rd grade classroom, I spent time as a Fellow at the University of Iowa’s Belin-Blank International Center for Gifted Education and Talent Development. At the university I learned, among other things, how to implement practical, classroom activities from leading gifted education researchers in the field. Student directed, project-based learning activities stress hands-on learning and immersion in the discovery of new information. Because we know that gifted students learn best through actively gathering the information necessary for problem-solving and then articulating what they have discovered through various media like a journal, artwork, or video, I created a unit about space travel by planning “A Mission to Mars” for our students. My goal was simple: through intense, collaborative, and solution-oriented assignments, students could experience the multifaceted nature of space travel. To achieve this goal, we broke down all the components of space travel — from building a space station, to training for our time in outer space, to meal planning. Gifted Project-Based Learning: An 8-week "Mission to Mars"
We began by discussing the best way to get our Mission to Mars project “off the ground” — pun fully intended. Our students quickly decided that we were going to need a space station where we could all work together and begin planning the trip. We started with structural engineering: how best to build our space station? Next, students conceptualized and designed the station, which included a central command module, medical module, science operations module, navigation module, and a botany module. Cardboard boxes, dowels, duct tape, Christmas lights, and zip ties proved to be ideal building materials. Once the space station was ready for occupancy, some of the students wanted to get to the main goal of actually getting to Mars now that we had a place to make it happen, while others just wanted to hang out inside our cool new space station. 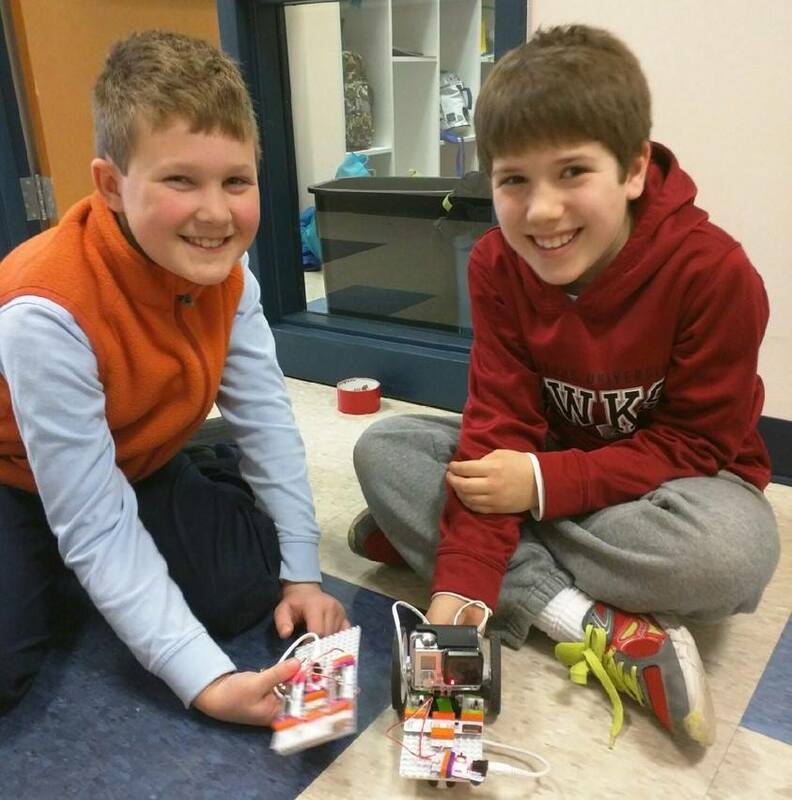 Two students testing our rover robotics. Students then designed and built their data collection rover, which was a Meccano robot with a GoPro attached via chest strap. (The students decided on Meccano because he has track-type feet and they thought that would be best-suited to Mars’s terrain.) Between his legs, we built and attached a collecting arm, made out of LEGO Mindstorms pieces and controlled remotely. At this point, as you can imagine, they were all pretty excited about their robot creations — and rightfully so — but rather than immediately putting the rovers to work, the mission’s goals required that students invest some time training so they knew how to maneuver and manipulate them carefully and accurately. Growing "Space Thyme" in our hydroponic garden. 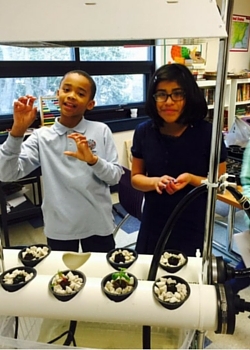 Maybe it was nearing lunch, or maybe we were just ready for a snack, but one day a student pointed out that we would need to grow our own food if we were going to be living on Mars, and suggested we build a hydroponic garden — is a soilless garden in which plants get nutrients and minerals directly from the water. Wisely, the students decided we needed expert guidance, so I scheduled a consultation with hydroponics experts who would help us create our final design. The basic design of the garden was pretty simple: a rig built on a rolling laundry cart whose basket held our reservoir and pump. We strapped PVC pipes above the reservoir, and planted our seedlings into the PVC pipes. Finally, we hung a grow light from the rack above the basket. We planted rutabaga, yellow squash, and “Space Thyme” (how could we possibly resist?). Now we were farmers on the move! Once the simulation began, students were split into two groups: Space Station and Ground Control. Each group had several stations that all students cycled through to make sure each role was clearly understood. An astronaut exploring the surface of Mars. Commander: The Commander was responsible for the overall functions of the Space Station and astronauts. One of the main duties of this role was remaining in constant contact with Ground Control to monitor and track the progress of the mission. The Commander was also the unilateral decision-maker in times of emergency and crisis. Botanist: The Botanist was responsible for maintaining the health and integrity of the hydroponic garden. Students tracked the pH of the soil in addition to the height and color of the plants, and would also be required to troubleshoot any problems with garden. Medical Officer: The Medical Officer was responsible for collecting and charting data relating to the health of the astronauts. Using a pulse monitor, the Medical Officer tracked astronaut’s heart function for three minute, recorded the data in a chart, and created a graph of the results. Their biggest challenge was to use mindfulness techniques to reduce astronauts’ heart rates by 5%. Navigator: The Navigator’s responsibility was to ensure that the Space Station was on the correct trajectory by measuring the apparent angles of several celestial bodies with an astrolabe. Students then had to use that information to determine the best course for the station. Science Operations: Science Operations was responsible for analyzing the samples brought back from the Martian surface to determine their mineral composition. Students measured and recorded characteristics including magnetism, density, color, and texture. Photo Analyst: In the weeks leading up to our mission, we teamed up with the (real) International Space Station to use their Sally Ride EarthKAM and were able to order specific photos of Earth from the exterior camera attached to the ISS. The Photo Analyst’s job was to try to match each photo to its location, given a brief description of each location. Exploratory Rover Operator: The Exploratory Rover Operator was responsible for landing the Rover on the Martian surface and then steering it around. 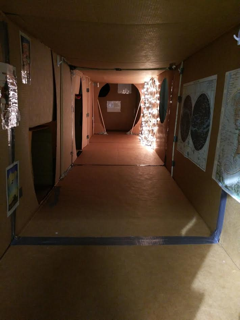 (One very enterprising student hand-built a simulated Mars terrain surface out of carved layers of cardboard and what must have been gallons of red paint; in keeping with our commitment to mission authenticity, we placed it out of sight, around a corner at the end of a long hallway.) This station was very tech-centered, involving use of a littleBits/GoPro Rover and an iPad which displayed the live-streamed images for navigation. Meccano Operator: The Meccano Operator and the Rover Operator had to work together cooperatively in order to collect and retrieve a sample from the “Martian surface” and deliver it back to Ground Control. In addition to each station, groups were presented with Disaster Scenarios, in which a piece of equipment would stop working or a major system would be disrupted, thereby cutting off Ground Control from the Space Station. Predictably, some chaos ensued, but no one panicked: all the “disasters” were handled as they happened and control was reacquired almost seamlessly. The Mars mission crew returns home! As planned, the mission took students eight weeks — from the first day of discussing the project to completing their Mission Manuals — with the whole-school simulation taking three of those weeks. Throughout the mission, our students really enjoyed the super big photos from Michael Sharpe’s book on Space. The visual references provided great context and inspiration. In our mission debriefings, the students rightly agreed that our mission was a tremendous success. As a result of our hard work, we are still monitoring the progress of the “Space Thyme” in our hydroponic garden, refining our robot designs through beta testing, and high-fiving Meccano when we see him in the hallway. Astronaut Buzz Aldrin once said, “by refocusing our space program on Mars for America’s future, we can restore the sense of wonder and adventure in space exploration that we knew in the summer of 1969.” At Grayson, where we consider ourselves #DefendersOfWonder every day, we put gifted project-based learning into practice every day. We want our students to be creative, critical thinkers who are as inspired — and prepared! — as possible as they prepare for their futures, whether that future is on Earth…or on Mars. NB: The Grayson School is an Amazon affiliate, and if you do choose to purchase a book through our links you will also be supporting our school through a referral commission paid to us. You will not pay more when buying through these links. 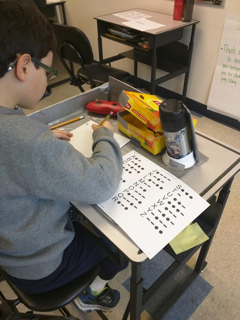 This blog post is part of the Hoagies’ Gifted Education Blog Hop! Is Homework Essential For My Gifted Child?